Everybody loves RED! An exciting color, beautiful to the eye, and by far, the most popular color in the retro arena. This is a 24”x24” square table top, laminated in Red Cracked Ice, with 2 ¼” metal banding. The coordinating chairs are our HandleBack chairs, upholstered to match! Perfect for a small area, a college apartment, a NYCity apartment…fits almost anywhere! Thinking Of Different Colors For This Retro Cafe Dinette? We Can Do That, Too. Let Us Know What You Have In Mind! For pricing information on our retro café seating give us a call at 304-728-0547. Or send us an email and one of our retro specialist will respond right away. We offer a great commercial customer discount when ordering in large quantities. Let us help you build your diner or retro restaurant. 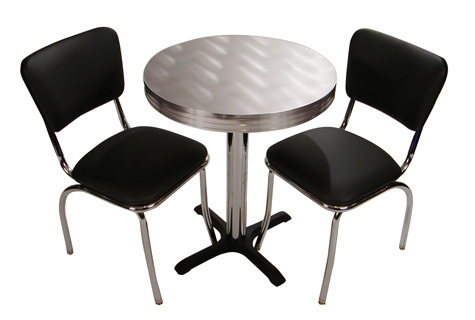 This retro cafe dinette features a 24″ Round with Premium Metal Laminate, 2 1/4″ metal banding and Classic Chrome Column Base. The two C1 Classic Diner Chairs are upholstered in Ebony. 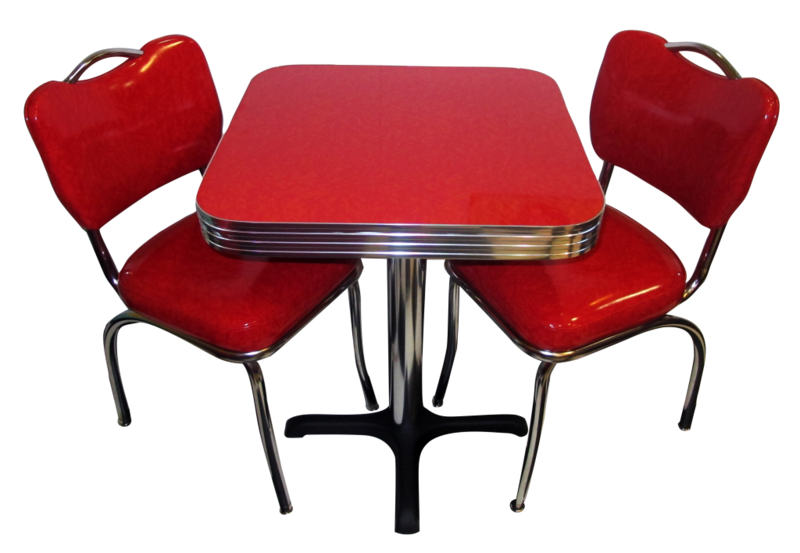 Our retro cafe dinette sets can be manufactured in almost limitless colors! We think this retro cafe dinette speaks “sophisticated, sleek, and elegant” but the best word is probably COOL! We love the unique table, a 24″ Round with Premium Metal Laminate, 2 1/4″ metal banding and Classic Chrome Column Base. The two C1 Classic Diner Chairs are upholstered in Ebony. The black and grey of this set can be used with almost any other color scheme for your restaurant or home. Pair these tables with a custom diner counter in black, add trim in a custom color, and everyone will be saying…very COOL! 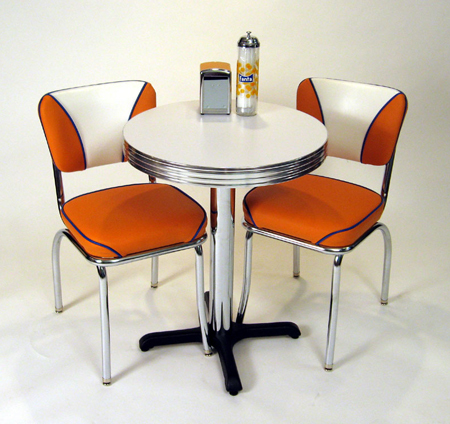 Fanta© Theme Cafe Table And Chrome Dining Chairs Are Designed And Made In USA. Commercial Quality – Built To Last! Using the colors of Fanta soda, this cute two-person set has two (2) 921 Series – Elite Retro Chrome Dining Chairs featuring a contrasting back insert, upholstered curved back, and a 2 inch waterfall seat pad with contrasting piping. Fantastic Fanta© Colors! The 24″ White Laminate Round Table Top has 2¼” Real Metal Banding, and a Classic Chrome Column “B” Series Base.